Important GST Frequently Asked Questions: GST is a single tax on the supply of goods and services, right from the manufacturer to the consumer. Credits of input taxes paid at each stage will be available in the subsequent stage of value addition, which makes GST essentially a tax only on value addition at each stage. So, We have provided here free PDF File of GST Frequently Asked Questions & Answers to prepare & clear doubts on GST Topic. ALSO, MUST DOWNLOAD ICAI FAQs & MCQs on GST PDF May 2019, CA IPCC GST Study Material & PM May 2019 & Overview of GST PDF By ICAI. FAQ on GST, Frequently Asked Questions on GST Questions and Answers PDF here available. Download Now below Free GST Frequently Asked Questions & Answers in PDF File. GST Frequently Asked Questions 2019 PDF Download Link is provided here below. 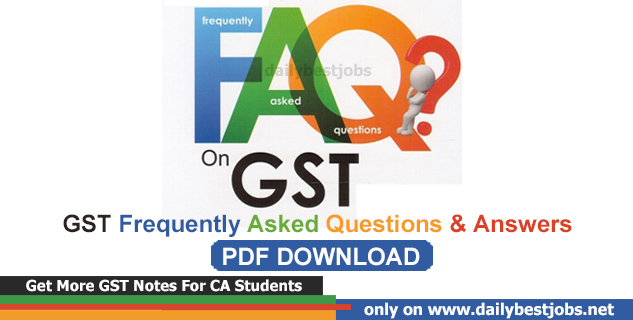 Now, You can Subscribe your email address to get free GST FAQ Q&A updates & come back to our website to check latest on CA May 2019 updates till you can check here more on CA Notes, Study Material, Free Certified Copies & Question Papers with Suggested Answers for CA IPCC and CA Final Students.